Tracy on her blog, Milkay Photography – Project 365, recently did a Playground Series. She photographed an old playground before it was to be demolished to make way for safer modern equipment. The series captured the nostalgia of a bygone time when kids played for hours without worrying about today’s over protective environment. Last weekend I was at Mercer Park in Baldwinsville, New York which has some swings which reminded me of the ones I played on in grade school. Then I spotted the warning on the seat. I am sure the swing manufacturer has a few lawyers on its payroll. At least it is made in the USA. Hear the sarcasm? Later in the day, I watched my niece’s son swinging as I remembered myself doing. Without a worry in the world. Just the simple joy of a swing. The simple joy of a swing. 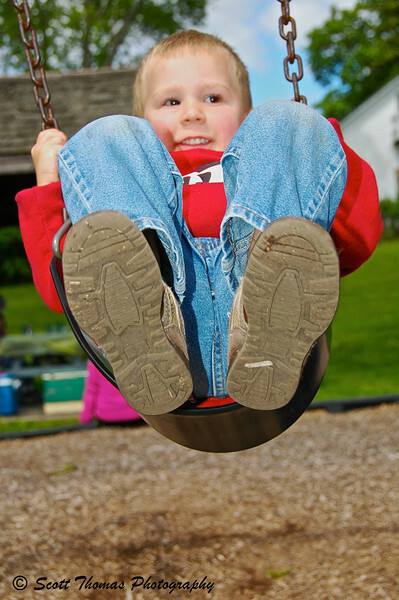 This entry was posted in People and tagged baldwinsville, boy, child, fun, happy, made in usa, new york, play, playground, sarcasm, smile, swing, swinging, warning. Bookmark the permalink. Oh yeah, you have to put warning labels on EVERYTHING these days, because you know that SOMEONE is going to hurt themselves (their own fault no less) and think they can sue the manufacturer. I like the warning labels on cleaning products, etc. that say “do not drink”. Mr. Bluejeans there is one happy looking little guy! I am fortunate that when Rob the Firefighter was little my uncle–a fine photographer–took pictures of him. Many years from now your niece will look at this picture and remember the days . . .
Wow, Scott – thanks so much for the mention! Much appreciated! 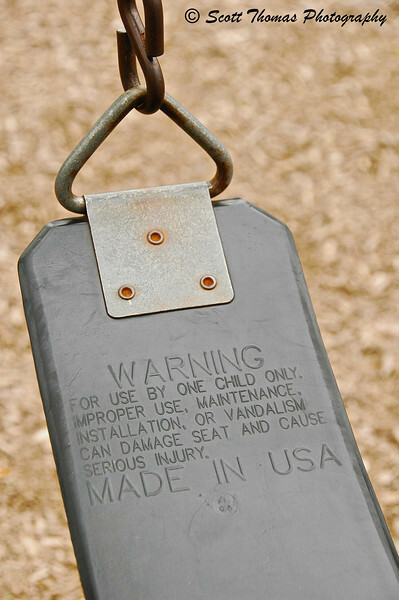 I saw these warnings on some of the swings I photographed (I specifically shot them so as to NOT include them). 🙂 I like that you embraced the warning! Those raised letters would certainly get branded on small thighs wearing shorts! I used to work in a quality control role and it is amazing what you have to include in warning labels to prevent liability these days. You did a wonderful job on that series, Tracy. Glad to point people towards it. Is the playground still there? I kind of like the stark mid-winter lighting which went well with the processing. Hey, at least they had swings. For a period of 4 or 5 months, the swings at the local school were removed since they weren’t safe for the other kids that were not on them. Since that was the playground I frequented with my kids, they were devastated. Someone caved (thankfully) and now the swings are back. Your image reminds me of the reason I had for getting a DSLR instead of my point-and-press-and-wait-and-shoot camera. I tried to shoot happy children on swings, but before I got the feeling of the timing needed, the children found more fun in another place. I STILL love swings! I always swing when I get the chance on those old-fashioned, sling-for-a-seat swings (some mean ol warning about my adulthood wouldn’t stop me, heh, heh!) Very cute shot!! I really like the joy of the swing! It’s too bad they think those warnings are necessary: times have sure changed! The swings I used as a child were installed by my grandfather and made of old, flat canvas firehoses. No chance of getting hurt on those. Swinging really is a simple joy. I’m going to have to take my grandson to the park one day soon.